As I argue in my book, Energy Security and Natural Gas Markets in Europe, market integration is the best tool to enhance energy security within the European Union and beyond. Better pipeline interconnections and harmonized rules and regulations (instead of fragmented national markets) facilitate more seamless natural gas flows throughout the European Union. This efficiency erodes the market power of dominant suppliers, such as Russia’s Gazprom. With more options to consider, natural gas buyers enjoy a greater diversity of supply and better leverage when negotiating with their suppliers—and thus more energy security. Critically, once in the EU, natural gas can be freely traded, as any other commodity. This market-based approach—which has been the leading paradigm of the European Commission—has been fairly successful over the past decade. These days, buyers pay more competitive prices for gas. Suppliers who do not play by the rules end up in court. But there is still work to be done to complete the so-called “internal” market—especially in Southeastern Europe—where gas markets are yet to be opened up and freed from the tight grasp of incumbents. Two broad developments are further complicating this European success story. First, following the war in Ukraine and landgrabs by Russia, “old school” Cold War geopolitics is back—with a vengeance. A fierce political debate has erupted over whether Europe should import even more Russian gas in the future, which is what market forces dictate. Second, European policymakers increasingly question the role of natural gas as they seek to transition towards a low carbon economy. The European Commission started a political campaign to complete what it has labelled the “Energy Union.” A fair amount of this concept is old wine in new bottles, but “diversity” and “solidarity” are key principles. Here, diversity means less natural gas from Russia, although it remains unclear who should pay for this. Several Central and Eastern European member states, as well as the European Commission, support this principle. The U.S. State Department, too, is vocally supportive, at the risk of throwing oil on an already smothering fire: The United States is “eager” to “promote the diversity of supply to Europe,” Tillerson said, offering continued support for European infrastructure projects that will “ensure that no country from outside Europe’s Energy Union can use its resources or its position in the global energy market to extort other nations.” Historically, this “support” has chiefly consisted of words of comfort, and at times more stringent advice. The principle of “solidarity” aims to ensure that member states will help each other out in the event of sudden supply disruptions. However, without much consideration for other member states’ concerns, the contested Nord Stream 2 pipeline, which will bring natural gas from Russia to Germany, may well be completed despite the objections. Its operator had planned its investment within an existing regulatory framework, but this framework has been subjected to heavy meddling for political purposes. The debate over the Nord Stream 2 project should have kick-started a meaningful discussion about the division of responsibilities (among governments, companies, grid operators and regulatory authorities, for example) within the European natural gas market. But to date it has devolved into gridlock between proponents and opponents. On its end, Gazprom could address most of the European states’ concerns by getting rid of its outdated practice of pricing natural gas on a national basis, which is one of the primary sources of energy insecurity in Europe. Gazprom’s pricing has substantial differences across countries, creating confusion and raising suspicions among some of its buyers. Instead, Gazprom could market its gas at a single EU price (adjusted for differences in transport costs) to compete with domestically produced resources and imports from other parts of the world. Once Gazprom’s pipeline export monopoly is lifted, other Russian suppliers could also compete for European market share. Natural Gas: What Role in the Global Energy Transition? There are also questions about the future role of natural gas in the transition toward a low carbon economy—including whether there should be any role for it after 2030. Renewable sources have made major inroads in the electricity sector, even though decarbonization remains a challenge (absent a well-functioning emissions trading scheme). However, in light of the urgent need to decarbonize, and considering the prominent role that coal continues to play in the EU, it seems premature to write off natural gas in power generation just yet. Our data suggest that Europe will likely need natural gas for at least a few more decades. Meanwhile, more can and should be done to improve the greenhouse gas footprint of the fuel source. Furthermore, Europe has to look beyond the electricity sector towards deep decarbonization across the entire energy system. Even if current policy initiatives to electrify large chunks of the heating, cooking, and transportation sectors are successful, this raises important questions about where that electricity would come from. In addition, the industrial sector is the second largest consumer of natural gas, and we have yet to find affordable ways to fully decarbonize industry without jeopardizing economic activity and growth. Thus, Europe finds itself at a crossroads. Markets have and will continue to improve Europe’s energy security, as long as markets throughout Europe are truly opened up and member states address security concerns collectively, not individually. However, continued securitization of a fuel source that continues to become more of a commodity will jeopardize this successful European integration project, and further complicate the European transition towards a low carbon economy. European leaders must decide what role natural gas plays (or does not play) in its energy economy in both the medium and long terms, and evaluate what steps need to be taken to reconcile that possible role with the need to be carbon neutral—or even carbon negative. Tim Boersma is a Senior Research Scholar and Director of Global Natural Gas Markets at the Center on Global Energy Policy at Columbia University’s School of International and Public Affairs. 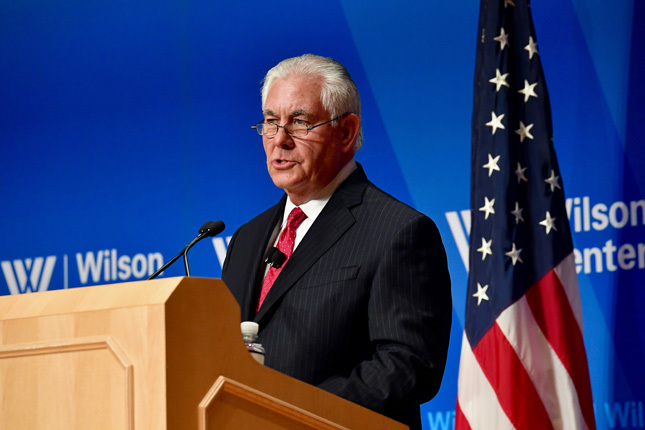 Photo Credit: U.S. Secretary of State Rex Tillerson delivers remarks on U.S.-European Relations, at The Woodrow Wilson Center, in Washington, D.C. on November 28, 2017. Courtesy of the U.S. Department of State.